4. Vitamins and Minerals: Vegetables and fruits are included without restrictions in the Paelo diet. And as a general rule, a colorful plate is a vitamin/mineral rich plate. Dairy is excluded along with grains which have potential implications for calcium, vitamin D and B-vitamins. There is no mention of vitamin supplements, but I can only assume that since they weren’t available 2.5 million years ago, they probably are a no-go. I’m giving this category a (0) since I am undecided. Since the Internet and a few books were limited help I decided to reflect on personal experiences. At the conclusion of my New Year’s Resolution food intolerance experiment, I determined that I have the most energy and the my GI system functions best when I avoid dairy and limit gluten, old-fashioned oats, and high-fructose fruits like apples, pears, grapes, and even honey. Yet over the past few months, I’ve allowed more and more gluten and processed foods to creep in. Is it a coincidence that I’ve had trouble waking up despite getting 8-10 hours of sleep? I’d like to get back to that energetic feeling. So I’ve decided to experiment on myself. A case study, if you will, to determine the compatibility of Paleo nutrition for a runner of moderate/average mileage. Over the next 14 days, I’m going to attempt to follow the Paleo principles (simplified here) and continue to run 50 miles a week. I’ll keep track of my sleep, energy and GI happiness throughout the two weeks and at the end, have a bit of an understanding of the Paleo craze and it’s “goodness of fit” among runners. And I’ll post a few recipes along the way. What do you know about Paleo nutrition? Do you have any good recipes or suggestions for making it work? Are you interested in outcomes other than sleep, energy and GI happiness? Next Charity Running Helps You Help Others! I’ve been Paleo and a runner for over 2 years now and I have seen some great gains in my overall health and well being and in my race performances. Granted getting over the “sandwich” hump was a struggle, I no longer have any desire for bread or oatmeal. Baked goods remain my downfall at times, but I limit them to Paleo-fied treats that use almond or coconut flour and little to no sugar besides honey. As a runner, I do incorporate a bit more white rice (naturally gluten-free and a safe starch) and some sweet potatoes for extra carbs on high milage days. I still take Gu with me on runs. Paleo isn’t hard, you just eat real food: nothing that comes packaged or frozen. Spaghetti squash is an easy go-to meal: It’s easy to bake and you can spice it up however you like. A great book for endurance running is The Paleo Diet for Athletes by Loren Cordain. I definitely think the Paleo Diet can be a good choice for athletes of all type. I agree with Courtney that The Paleo Diet for Athletes by Loren Cordain is a great starting point for runners or CrossFit athletes considering paleo. My recommendation would be to time your carbohydrate intake the way it is outlined in the book and shoot for getting your high glycemic carb sources in as soon after your workout as possible (30 minute window). That would be a good time for a potato or rice if you eat it. I think the best thing about cutting out the cereal grains is better energy levels, no more digestive issues (for me anyway) and no more inflammation. I also HATE diets. This is why I prefer to use the phrase “paleo nutrition” vs “paleo diet.” I believe in food as “medicine.” I believe our bodies are as healthy and clean as the foods we choose to fuel them with. Modifications to the food I eat are rarely, if ever, motivated by weight loss. They are motivated by overall health. This is not the first time I have felt misunderstood in terms of food choices and philosophy. I hope this comment will clear that up. I do not advocate caloric restriction or “diets” for any runner. Since I know dairy and to some extent, gluten, are hard for my body to process, the Paleo philosophy seemed like a natural fit. But I also really dislike the “food-like substances” that end up in many gluten free starches to make up for the missing binding property of gluten. Things like Xanatham Gum, Guar Gum and other processed chemicals. My experiment is to see if I can fuel moderate mileage without gluten-free starches, something I’ve never tried. Stay posted to learn the outcomes! What I meant was that “diets” in books or promoted through products, etc. tend to be gimmicky and overly restrictive to certain things. I prefer a free form eat as healthy as possible approach, is all I meant about my hatred of diets. I’ll be interested to see how this goes for you. I am also intrigued by the concept behind Paleo. And I too don’t really get the whole elimination of grains. Or how endurance athletes can do on a diet like that. But that’s why you’re here, right?! love it …i love experimenting as well!! can’t wait for future posts! I’ve been paleo for about 6 months now and I feel terrific! I exercise every now and then but I wouldn’t consider myself an athlete. I do however agree with courtney about Dr. Cordain’s “Paleo Diet for Athletes”. It provides great info on what to eat before, during, or after a workout. It also informs you of how specific foods break down which help your performance. As far as grains, potatoes, rice and corn, while these are the grains or fruiting bodies of plants, the modern varieties of these plants are the result of generations of human cultivation. Potatoes, indigenous to South American mountain countries, for example, were originally little more than a slightly bulbous portion of the root of an otherwise inedible plant. Corn, the Native American people cultivated in similar fashion from a very small ear that most people today would not even recognize as ‘corn’ into something similar to the modern form (which has changed even over the last 50 years and is often genetically modified today). 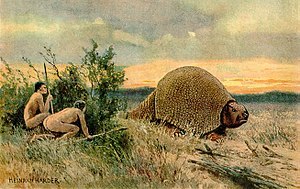 The idea of paleolithic dieting is evolutionary. We haven’t had time to evolve to adapt to the “modern” diet which is the result of agriculture. Moreso, we aren’t able to handle the inorganic compounds found in processed food. I know you realize all that, but what I am getting at is that these starchy vegetables and grains are really a modern invention – even though they are rooted in the natural world. So is the banana, and many other commonly consumed “paleo” foods. Wild blueberries and strawberries look little like their cultivated counterparts. To really get paleo, do some research about seasonal, local wild edibles and go and collect them yourself.